The Pinzgauer is a high mobility all terrain vehicle named after a breed of Austrian horse and will climb hills like it has 4 legs. The 710k is one of the common members of the family of 4X4 military vehicles built from 1971 to 2000 by Steyr-Daimler-Puch AG in Graz, Austria with the Pinzgauer name on it. 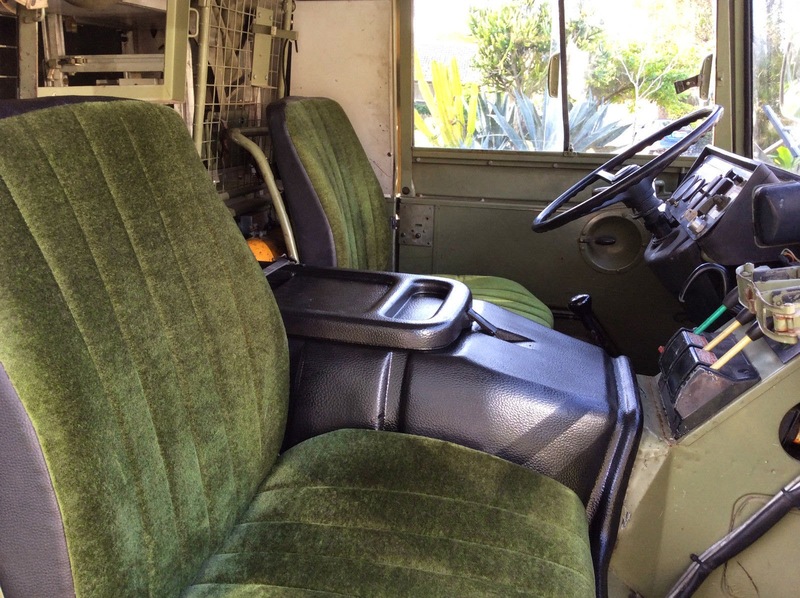 Find this 1983 Pinzgauer 710K offered here on eBay for $14,000 buy-it-now or best offer, located in Pompano Beach, FL. Tip from Dave M.
The 710K denotes a 4X4 model (712 models are 6X6) with a hardtop station wagon style setup (M is soft-top 10-passenger, T is flat bed and AMB are ambulance varieties). Out of all the Pinzgauer setups it is the most friendly for a lunatic who wants to drive this every day. Seriously, if you had a short commute how is this any different from a Land Crusher or HD pickup? Other than being better in every way, of course. Under the hood is a 2.5 liter air cooled inline-4 cylinder gasoline engine that will push out 87 horsepower and 133 ft-lbs of torque. It isn't the fastest thing on the road, but the air cooled engine is durable and easy on fuel compared to most military vehicles. The wagon (K) variant can come equipped with two rows of center facing bench seats in the back for 10 passengers (including driver) but this ones has a bunch of racks and crap in the back for storage. This would certainly be the last wagon I would ever need, because my wife would kill me if I came home with this. I think sellers should include a photo with a person, to give scale. These things are much more compact than they might appear. I commute home past these guys every day. If anyone out there in DT land needs a basic inspection done on something on their lot, I can handle it during lunch. They have a G-Wagen troop carrier sitting out front now that is drool-worthy. Automatic trans though, but otherwise freakin' awesome. An oddball G-Wagen with a GM LSA crate-motor package tickles my loins but it's got to clear the Geheime Smogpolizei around here. 1989, click here for pics. Oh my goodness, we've all just witnessed a miracle...mrkwong actually had a conversation with somebody. RyanM, it is now decreed that Tuesday, April 14 shall be forever known as Saint RyanM Day, which has something to do with something that probably shouldn't be repeated but indicates that you were the person to accomplish what seemingly could never be done (brief as it were). All Hail, Saint RyanM! K2MC, shift that day 2 to the right, and it'll end up on my birthday. Perfect timing ha ha. In other news, I stopped in yesterday after work at 5pm on the noggin and the place was locked up and empty. Looks like an appointment-only type establishment. Had a rad looking 1940's powerwagon out back. Hey man, HAPPY BIRTHDAY! That's awesome. I hope you have a GREAT one! Thanks! In the process of having a great one, the wife surprised me this morning with a sculpture of the LBGP track from tracksculptures.com. The GP typically falls on my birthday weekend every year, so it's an easy b-day present for her to get us tickets. This year we're on babywatch (38 weeks along) so we can't make it... so she thought the next best thing was the sculpture... and a rebuilt head for the Z (the 8500rpm cam doesn't like 6500rpm valve springs, apparently... who knew?). Talk about marrying above my pay grade. She's a KEEPER! That really is a fantastic b-day present. And congratulations on your newborn! That's wonderful. Get any sleep yet? You guys' first? Not quite newborn... yet... 38 weeks into the pregnancy I should have said haha. Due 4 May. But thanks, we're stoked. '72 240Z, bought it from a feature on DT about a year ago. Converted to 5spd manual (was factory auto), replaced the fuel tank as it had been sitting forever, put a reground cam in it from MSA along with the twice pipes and a pair of rebuilt carbs. With the cam, the car only made power from 4000 - 8000, but the valve springs only did what they were supposed to do from 600 - 6500-ish. Then on one WOT run through the gears a few weeks ago the throttle cable stuck and she touched 8000 rpm briefly... and, well, now I have 12 valves that need to be replaced. Oops! Heh heh. Again, congrats! Girl, boy or you want it to be a surprise? Nice Z. I love the 240 the best, of course. I hope you get it fixed quick and it's back on the road soon. Thank you Sir. Boy. Decked the room out in some of ArchDuke Maxyenko's stuff from Society6. I'm a huuuuuuuuge fan of the 240z, specifically the one I found here. Perfect definition of a "driver". Not so far gone that I can't strip it down to bare metal and do right by it one of these days, but not so perfect that I get worried in the WalMart parking lot, or taking the 405 (when we lived in CA) on a Friday. The head and gasket set isn't here yet but it's on order. Hope it gets here before the kiddo does, otherwise it'll have to wait a few weeks before I put it on. Congrats on (almost) having a boy! I hope your son shares your enthusiasm for cars. If not, that's fine too, of course. DTers...you might choose to note the conversation I just had with RyanM. There were questions and there were answers. Mostly one sided, but still...it happened. That's the stuff you want in your life, not living in the tiny, airless bubble of your head. I'm not saying you're going to strike up meaningful conversations with absolute strangers online all the time, but it's worth a moment of your time. Consider what your fellow DTers are saying and don't be afraid to ask a question! Be inquisitive. Be curious. Be alive. Striking up (or butting into) meaningful conversations with absolute strangers online is essentially all I ever do too. Not sure why others are so against it. Might be due to the fact that with this commenting system, and being "userID/URL" sometimes you lose track of conversations you were in or posts you made, so when someone replies you never see it. Happens to me all the time. Once it's off the front page or off the top-50 comments list, I lose track. All good points RyanM, especially about the format not being conducive to conversation. Thank goodness for the Last 50 Comments button, as you pointed out! One benefit to having the Google account sign in is that I can check the "Notify me" box and get an email if/of a response (which usually isn't a response, just another statement of whatever is in that person's head). That way, I don't run the risk of missing a conversation. But I don't think people choose to not do it (make conversation); I think it's a skill that's been lost. People also don't receive as much as they transmit, which is just plain narcissism. Fortunately, it's an easy pattern to break. 1. Person A makes a comment. 2. Person B reads it, responds and asks another question or questions. 3. Person A responds and then, in turn, asks a question of Person B. ...and the cycle continues until the natural conclusion. Which isn't happening. Here, online or anywhere in real life. You might get REALLY lucky and get to step B, but it's step C that's the real problem. Want to try something fun? Utilize the pattern with anybody other than close friends and family (even then, sometimes!). How far do you get? How much information can you get from the other person before they ask something of you? I'll bet that at least 9 out of 10 times you get something out of them while they ask absolutely ZERO about you. That's not sharing, that's not communicating...that's just plain disturbing. I have an interesting job and yet when it comes up in conversation, I get a blank stare. Really?!? You know somebody like me? And it's true of other people. When I find out whatever they do, I use that information in a conversation when a third party joins us. "Hey, did you know Joe here is an environmental lawyer? Isn't that cool? He's literally saving the planet! And Joe, did you know that Paul here is a neurophysicist? Isn't that incredible? He really makes me nervous. Har har har." Again, same result most of the time; nothing, zero, zilch, nada. Or maybe it's just my bad jokes that are bringing the conversation to a screeching halt. But I don't think so. I think people are not curious, they're locked inside their own heads and they frankly don't give a crap about anything or anyone. They're, like I said, dead inside. That's a pretty accurate way of looking at it, never really noticed it but you're 100% correct, people love talking about themselves, and couldn't really care about others. One of the things they tell you to do in order to keep someone from whom you want something engaged in a conversation is to keep asking them questions about themselves. People will talk about themselves for hours. It's pretty fascinating. And an indication of a sick mind. A friend of mine has one of these. It's a very capable off-roader - when you finally get there. Top speed is around 55. And, oh yes, you're sitting over the front wheels so make sure that you have a safety harness and make it snug. I recall back in the day when David E Davis was writing about these in one of those paper things. In a few years, market conditions depending, I'll buy my daughter one of these so she can drive off into the woods and do things I don't want to hear about with whatever boyfriend she has at the time. Assuming she has a BOYfriend, of course.